The Delhi Mumbai Industrial Corridor Development Corporation (DMICDC) has been playing a pivotal role in creating an enabling business environment through development of integrated infrastructure keeping in view the needs of building a new India. 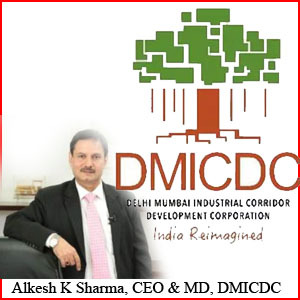 Alkesh K Sharma, CEO & MD, DMICDC, shares his thoughts on the opportunities and challenges the project presents and the way it is gradually transforming India’s economy. 1. What are the potential benefits of the $100 bn DMICDC project for the States it covers? DMICDC project gives a major impetus to transit oriented development by reducing the cost of transportation and inventory holding. The high impact, market-driven nodes will drive the overall regional development by creation and growth of new businesses through collaborations and innovations, along with enhancing the development, transfer and commercialisation of technology. The development of integrated infrastructure facilities and enabling business environment will help to attract domestic and foreign investment. This will generate huge employment opportunities and tax revenues for the States. 2. With about 38 percent of the proposed western Dedicated Freight Corridor (DFC) between Delhi and Mumbai passing through Gujarat, how is the Gujarat Government leveraging the business opportunities being presented by the project? The Government of Gujarat is developing one of the largest greenfield futuristic industrial city in Dholera. It has ensured integrated connectivity by means of an MRTS between Ahmedabad and Dholera SIR, laying of railway line from Bhimnath to Dholera and greenfield airport for freight and passenger traffic. This will ensure seamless supply chain resulting in quick procurement of raw materials and direct market access for finished products for companies operating in Dholera Smart City. Dholera is also providing opportunities for developing solar power and other renewable energy projects besides giving ‘Live, Work & Play’ facilities to potential investors in India’s first IGBC Platinum City. 4. What are the potential benefits of the $100 bn DMICDC project for the States it covers? 5. With about 38 percent of the proposed western Dedicated Freight Corridor (DFC) between Delhi and Mumbai passing through Gujarat, how is the Gujarat Government leveraging the business opportunities being presented by the project? DMICDCThe Government of Gujarat is developing one of the largest greenfield futuristic industrial city in Dholera. It has ensured integrated connectivity by means of an MRTS between Ahmedabad and Dholera SIR, laying of railway line from Bhimnath to Dholera and greenfield airport for freight and passenger traffic. This will ensure seamless supply chain resulting in quick procurement of raw materials and direct market access for finished products for companies operating in Dholera Smart City. Dholera is also providing opportunities for developing solar power and other renewable energy projects besides giving ‘Live, Work & Play’ facilities to potential investors in India’s first IGBC Platinum City. 6. What are the major challenges faced by DMICDC in terms of completing the country’s biggest infrastructure project? Acquisition of large, contiguous and litigation- free land parcels for a project of such a massive proposition was the foremost challenge. Benchmarking all the trunk infrastructure facilities for city utilities against best global standards was quite arduous too. Another challenge has been erudite master-planning for each node/ project with respect to future-proofing of infrastructure considering optimal allocation of resources with respect to urban amenities. The Government of Gujarat is developing one of the largest greenfield futuristic industrial city in Dholera. It has ensured integrated connectivity by means of an MRTS between Ahmedabad and Dholera SIR, laying of railway line from Bhimnath to Dholera and greenfield airport for freight and passenger traffic. 7. How is DMICDC leveraging latest innovations and technologies to bring in efficiency into its operations? DMICDC smart cities present a global, unique example where all underground utilities are fully digitally integrated across all segments of urban governance. An integrated command and control centre will be the nerve centre for proactive monitoring and control of city infrastructure. All land parcels have been mapped on GIS platform and land application & allotment process will be online through e-auction only. Sensor-based utility management by means of Scada, smart grids and real-time data networking will enable uninterrupted supply.